From the brilliance of the Buck Clayton Legacy Band at Sage Gateshead to the brilliant guitar duo of Birkett and Johnston at the Jazz Café to catch the last half an hour or so of their set. Party goers were getting in to the swing of things, ten thirty a little early for the stop-outs. Herbie was in his horse box, patched up, he’ll survive. At skateboard central – the Head of Steam –an indie thing was going on, wannabe dudes on the street practicing dude-ism at the door. Pink Lane and wouldn’t you just know it, Oh when the Saints…go marchin’ in. The party goers needed little persuasion, singing (and swaying) along to the resident Pink Lane Balkan street band. From the surreal to the sublime…James Birkett and Bradley Johnston were playing jazz guitar; All the Things You Are. 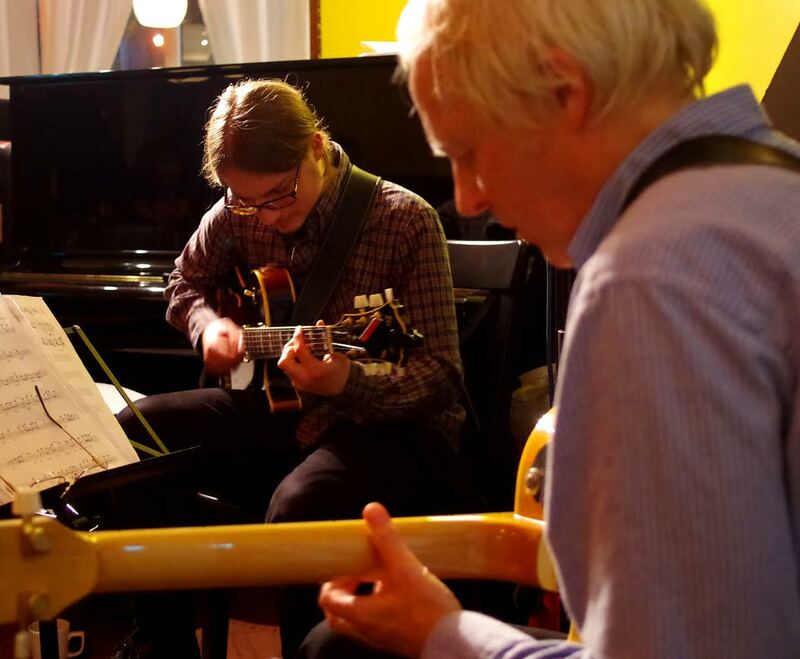 A one time master-pupil arrangement, theirs is now a duo, pure and simple: Birkett and Johnston, jazz guitar duo. Student Bradley Johnston – he is still a student, soon to graduate – has grown from an Adrian Mole 13 and ¾ years old (or thereabouts) in to the real deal, able to stand alongside, or as he does, sit alongside James Birkett as an equal. Dr Birkett is a master musician, he cannot be other than proud of BJ’s development. Imagine Johnston as Lonnie Johnson and Birkett as Eddie Lang, playing Blue Room in a 20s roadhouse. A bit of a stretch, granted, but for a wee while the Jazz Café transported its Saturday night crowd to somewhere along the turnpike in Hicksville. James’ Waltz, a Johnston composition written for a certain JB, then a certain Nuages, then the duo’s now familiar showstopper, Chick Corea’s Spain. Birkett remarked that this was just about the first tune he and Bradley played together. BJ nodded. If they could play Spain they could play anything. And of course, they did. Tyneside (and beyond) is lucky to have so many ‘hang-your-hat-on’ musicians on the doorstep. Birkett and Johnston are two of them. Footnote: Herbie (local knowledge required) is doing just fine.